With no reliable shelter, no access to clean water or sanitation facilities, and no real way to earn a living, the urban ultra poor are unmatched in their vulnerability and need. 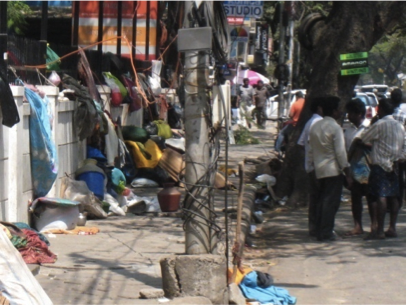 They struggle daily to find food while under constant threat from illness and crime, and commonly rely on begging as their only source of income. Seeing the need to move pavement dwellers off the streets and into a secure home, Chennai-based Equitas Development Initiatives Trust (EDIT) partnered in 2009 with the Sorenson-Unitus Ultra Poor Initiative (UPI) to pilot an effective yet cost-efficient program that could address this problem. Through its Bird’s Nest program, EDIT provided housing, food security, healthcare, livelihood skill development, and supplemental education to ultra poor families over an 18-month period – ultimately placing them on the path to self-sufficiency. The pilot revealed two critical insights that dramatically improved the success and cost-effectiveness of the program. 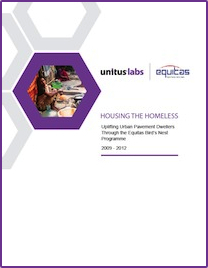 First, it showed that income security was the primary priority among the homeless – even topping shelter as a concern. Despite the immediate availability of secure housing, the team realized that families feared losing their places in high-traffic areas and the means to their only source of income: begging. So to coax the families into leaving their locations on busy streets, they had to establish an alternative livelihood. In response, the EDIT team accelerated the introduction of structured income-generating activities – rolling incense sticks, candle-making, soap-making, and basket weaving – allowing participating families to move into new housing with the confidence that they would be able to earn enough to meet their needs. Second, the team recognized that the introduction of an income-generating activity made it possible to recoup some of the program’s costs, as beneficiaries are both able and willing to pay for services. All beneficiaries that have been moved into housing were able to successfully take over and continue making their own rent payments. This means that instead of spending the average $600-$800 per-beneficiary common in other ultra poor programs, EDIT is on the path to achieving more economically-sustainable change for approximately $60-$100 per-beneficiary. Looking at those ultra poor individuals who have completed the program, the cascading benefits of this livelihood-led approach to housing security are apparent. As a result of the move into stable housing, most people who couldn’t cook on pavements are now preparing their own meals every day. They also have access to water which allows them bathe everyday, wash their clothes regularly, and generally maintain a higher standard of hygiene. Most importantly, they now live a life of dignity and self-confidence, and have traded ridicule for respect and acceptance in the community.